Colorado Springs, A Changing Landscape, is a photography exhibition and book release party that celebrates the City of Colorado Springs past and present. Eight talented Pikes Peak Community College student photographers (current and alumni) set their sights on documenting iconic locations in our city that were once photographed by early local photographer, Glenn Wesley Murray, 1906–2004. Murray photographed actively from the early 1930s to the mid 60s. The exhibition is available for viewing until December 15, during regular hours of Centennial Hall, 8 a.m. to 5 p.m., Monday through Friday. In what has become part three in a series of exhibitions of the work of Glenn W. Murray, Colorado Springs, A Changing Landscape follows CityWorks (2014) and CityWorks 2.0 (2015), two exhibitions of historic photography that were received with much enthusiasm by the public. In this latest series, modern-day photography has been paired with Murray’s historic views to reveal a changing landscape in our city. 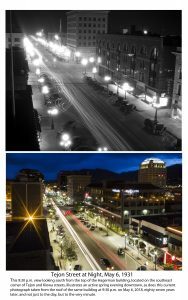 Susi Holmes captured a night shot of Tejon Street from high atop the Hagerman building eighty-seven years to the minute to mirror Murray’s historic view. Ken Slager and Joseph Baldwin will wow viewers with a night shot of Palmer High School that mirrors Murray’s efforts to capture General Palmer’s shadow sitting proudly upon his steed against the façade of the old, Colorado Springs High School. These two shots, among so many others, capture the essence of our beautiful city and the growth we have experienced in as many as nine decades. 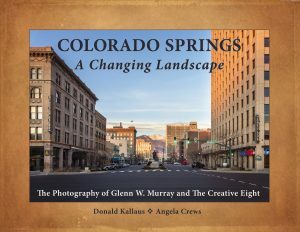 Don Kallaus of Rhyolite Press, LLC in collaboration with Angela Crews (adjunct faculty at PPCC, and a member of Rhyolite Press) teamed up to bring this fascinating and significant look at the changes in our city. Enlisting the help of eight talented photographers; Joseph Baldwin, John Bawi, Margaret Beaty, Susi Holmes, Jim Mangette, Ken Slager, Jodie Westbrook Bomze, and Jennifer Williams. Colorado Springs, A Changing Landscape provides us an important inspection of our city, the changes that come with modernization and time, as well as pause to consider what is important to us as we move forward. Opening reception: October 26, 2018 7:00 p.m. Centennial Hall, El Paso County Offices, Downtown Colorado Springs, 200 S. Cascade Ave. This exhibition and book release party are sponsored by El Paso County.